The book ‘The Power of VPL’ is both result of the project ALLinHE as well as an agenda for further exploring and paving the way for VPL, not only in higher education but also in other qualification-levels and – even better – in contexts of work, volunteering, citizenship, inclusion-activities and leisure. Learning is more than ever important and valuable, people are encouraged to invest in their potential throughout their lives, taking into account their prior learning. According to policy papers all across the globe, this should concern all citizens, including the underrepresented groups and non-traditional learners with regard to higher education because everywhere the knowledge-economy needs more higher-educated participation from all. recognising prior learning and providing individualised support enhances participation of underrepresented groups and non-traditional learners in higher education (HE). The strategic framework for European cooperation in education and training (ET2020) supports this. However, HE-institutions are still considering how to offer/support lifelong learning perspectives and making use of the added value of methods for Validation of Prior Learning (VPL). Some universities develop VPL-practices as an answer to economic and labour market needs; others use VPL as a way to widen access and participation of target groups which are obstructed in getting access to HE. Reality therefore calls for action on making HE more accessible for underrepresented groups and non-traditional learners by focusing on flexible lifelong learning-strategies, opened up by tailor-made VPL-approaches. a) further developing and implementing existing national legislation on VPL-enhanced lifelong learning in the learning domain, especially of HE. b) shifting from national projects on integrating VPL in tertiary education-levels to practical implementation. c) organising the levels of professionalism in HE to be able to cope with customer-steered and competence-based lifelong learning, like functions of guidance, individualised and flexible teaching/learning, managing flexibilised programmes. In Europe and Asia (South Korea) resulted in an overview showing the diversity of target groups to work on for creating solutions for social inclusion, more specifically migrants, refugees, elderly (50+), ethnic minorities and special needs groups. summative VPL, with convergent use of various standards within qualification-related contexts, showing the most efficient way to a (HE-)qualification for the target groups. 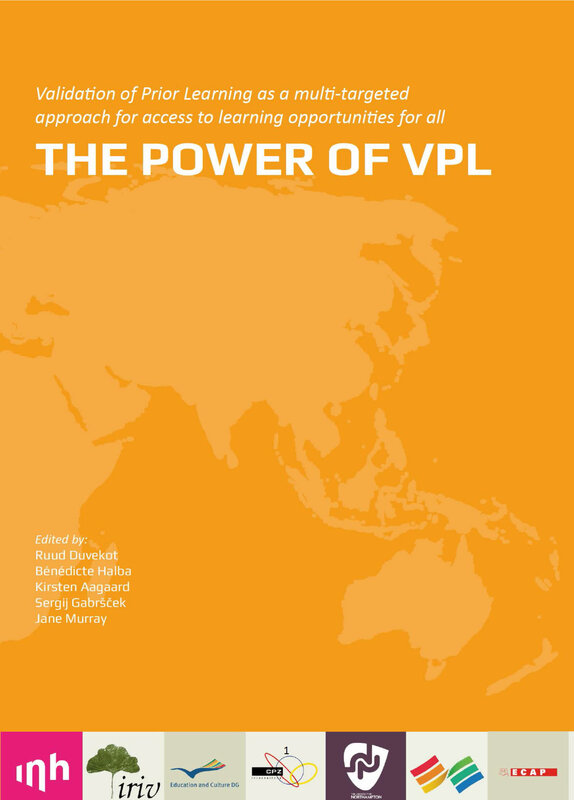 With this book, the aim is to show that lifelong learning is possible in any context, country and culture, and that there are always shared elements that make it possible to make a manageable tool for lifelong learning out of the methodology of VPL. Why this is so relevant and of value to the citizens and their organisations across the globe is explained in the variety of approaches, practices and visions, presented in this book.